More great gifts for £50 or less: posh secret santa gifts for the family! If you've already checked out our previous guide to the best presents under £50, then here's some more ideas for you! And if you haven't checked that page out already, then open it up as well! Be sure to check out T3's other gift guides to keep the whole family happy. Remember, Christmas is better with T3.Let's get started, shall we? This cute wearable keeps tabs on your steps, sleep and swim sessions (it’s water-resistant to 50 metres). Pop it on your wrist or attach it to your clothing (via the included clasp), sync it with the Withings Health Mate smartphone app and get tracking. The e-ink screen is easy on the eyes, and the eight-month battery life is generous. Is your nightstand covered in gadgets? Yeah, ours too. Help your iPhone or iPad stand out among the clutter with this aircraft-grade aluminium and weighted silicone charging dock. The DOCK+ Lightning comes with a four-foot Lightning cable and three differently sized adaptors, so you can charge your phone or tablet whether it’s naked or housed in a case. 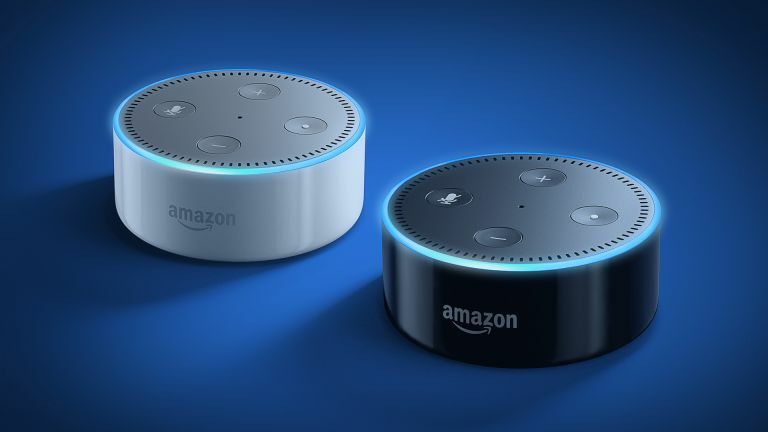 Control your smart home devices, stream music and set your morning alarm with Echo Dot, a voice-controlled PA. This far-field device hears voice commands even in the noisiest environments, thanks to seven built-in mics. It’s compatible with the likes of WeMo, Philips Hue and Spotify, updates through the cloud and continuously learns new features to stay ahead of the curve. These minimalist-looking cans, available in four colours, serve up a quality audio performance on a small budget, delivering a surprisingly good bass response and a crisp sound. The folding design makes them a prime candidate for the daily commute, and the combination of an adjustable headband and padded, memory foam cushion cups amps up the comfort factor. Can clothes enhance your workout? You’ll soon find out with this compression shirt powered by ‘37.5 technology’ to keep your core temperature stable. How? The shirt is infused with active particles that attract then evaporate sweat, keeping you dry and physically primed. Mesh panels aid breathability and an odour-resistant fabric stops you from working up a stink. One of the best things about camping is cooking outdoors, and whipping up a pot of cowboy beans is easy with Vango’s folding, 2600W stove. This high-load bearing gas beauty utilises a fast and reliable Piezo ignitor, while an included windshield shelters flames from robust winds. In need of a cuppa? It’ll boil one litre of water in five minutes. Get a taste for kitsch with this lightweight GPO speaker. Fitted with a carry handle, this Bluetooth stunner is ideal for taking on picnics and houses a rechargeable battery providing up to five hours of use. The cloth-style grill and metal corner accents enhances the vintage style, and bass and treble knobs offer greater control over your music. Pair your iPad with this award-winning game to introduce your littleuns to coding. Designed for kids aged 5-12, Osmo Coding teaches logic skills and problem solving, pairing physical blocks with an interactive game centred around a character called Awbie. With each coding command, Awbie goes on an adventure to find and eat strawberries. Cute game. Essential tech skill. Don’t get your buds in a knot – arm yourself with Talk Wraps anti-tangle earphones. Available in a rainbow of colours, these fabric cable earphones can be fastened around your wrist like a bracelet when not in use. The sound quality is decent, and a universal one-button mic enables you to play/pause music and answer calls on the go. he humble lightbulb is now pulling double duty. You see, the Boost LED Bulb is a ‘Wi-Fi repeater’, working to extend the range of your home’s Wi-Fi network by thwarting pesky dead spots. To use, plug the dimmable bulb into a screw socket lamp, download the Boost smartphone app and connect the bulb to your Wi-Fi router. If your nipper keeps stealing your smartwatch, treat them to their own courtesy of Vtech. This colour touch-screen wearable takes photos, records voice notes and has a Fun Time Master feature to help kids learn to tell the time. It also has a range of watch faces, an alarm clock, stopwatch and timer, plus three built-in games. Up to 80 per cent of bad breath comes from odour-producing bacteria on the tongue. Grim stuff, but if you own a Philips Sonicare electric toothbrush you can eliminate huge swathes of it. How? Pair your Sonicare with the TongueCare+, a brush and spray duo that scrubs away bad breath-causing bacteria lurking beneath the surface of your tongue. Compatible with Amazon Echo, this smart home plug, designed to work with the mydlink Home app, enables you to control your home’s electronic devices remotely. Plug your chosen device (such as a slow cooker or kettle) into the Smart Home Plug and you’re instantly connected. Via the app you can also monitor energy usage and create on/off schedules.